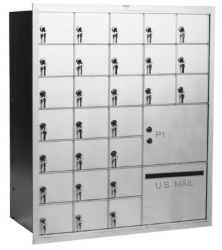 U.S. Mail Supply is your online source for quality, American-made mailboxes for everything from single box residential mailboxes to wall and pedestal mount mailboxes for multi-unit properties with hundreds of tenants. 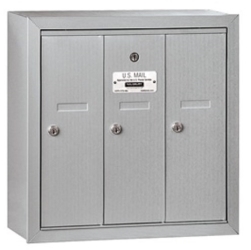 We carry mailboxes for indoor or outdoor placement, as well as drop boxes, key holders and trash receptacles. Built with steel and aluminum, all the mailboxes we carry are made to last through years of hard use and inclement weather. Order online and we'll deliver to you anywhere in Colorado. It may seem like everyone’s communicating by email, but mail is still essential for businesses. Whether you need a single mailbox for a home-based business of hundreds of mailboxes for an office complex, U.S. Mail Supply gives you options—including both USPS approved mailboxes and private use only mailboxes. Most buildings with multiple tenants have USPS approved 4C horizontal mailboxes. We carry these in a wide range of sizes and in colors that work with virtually any architectural color scheme. With custom configurations available and design assistance from our staff, it’s easy to get just the right mailbox for your building. The U.S. Postal Service has specific requirements for mailboxes. If you want them to pick up and deliver your mail, you need a USPS approved mailbox. 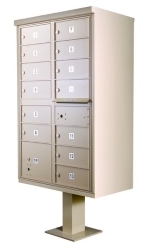 We have an extensive inventory of mailboxes that meet all Postal Service requirements right out of the box, and we provide detailed installation instructions to ensure you meet all their requirements. Mail and package theft isn’t just on the rise, it’s becoming commonplace. Your best defense is a secure mailbox. That’s where U.S. Mail Supply can help. All the mailboxes we carry are built with heavy-gauge steel and aluminum, equipped with secure locks and have vandal-resistant finishes. 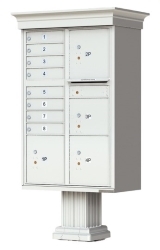 Choose from indoor, wall mount mailboxes or outdoor pedestal mount mailboxes. 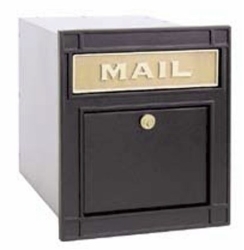 U.S. Mail Supply has a huge selection of high-quality outdoor, pedestal mount mailboxes for installation at businesses, educational institutions, government offices and any multi-unit residences. Choose from USPS Approved mailboxes or private use only. Custom configurations available to meet the needs of your building. Indoor mailboxes may not have to withstand inclement weather, but they’re subjected to plenty of wear and tear from daily use—which is why it’s so important to get mailboxes built to last. U.S. Mail Supply only carries quality-built, American-made mailboxes. Choose from USPS Approved or private use only, with deep customization options. All too often, homeowners look for the cheapest mailbox they can find, only to end up having to replace it in a couple of years when it starts to fall apart. A well-built mailbox is not only a one-time purchase, it’s also the first line of defense against mail theft. It’s why U.S. Mail Supply only carries heavy-duty, American-made mailboxes. 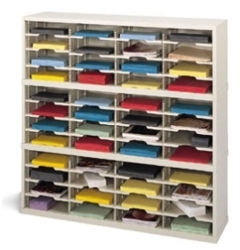 Mail sorters aren’t just for mailrooms, they’re also a great way to keep business documents and literature organized. U.S. Mail Supply carries high-quality formed and welded steel sorters and organizers of all types—open back, closed back, even HIPAA compliant sorters for secure sorting or storage of sensitive documents. The only thing worse than finding your mail is soaking wet after a downpour is finding your mail has been stolen. Whether you’re buying a mailbox for your home, or tasked with procuring mailboxes for a multi-unit residence or business, investing in secure, mailboxes is a decision you won’t regret. U.S. Mail Supply only carries high-quality, American-made mailboxes built with steel and aluminum to withstand both Mother Nature and your “fellow” man. With so many mailboxes to choose from, most with numerous configuration options, choosing one can be difficult. If you need help or advice, just give us a call. We’re here to help you make the best decision. 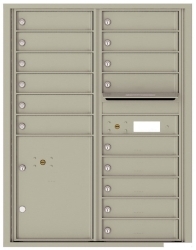 Poring through page after page of mailbox configuration options can be a daunting and time-consuming task—which is precisely why U.S. Mail Supply offers design assistance for custom mailbox configurations. To get started, click one of the two options listed below and fill in your responses to the questions about the type of mailboxes you need and where they’ll be located. After you submit a completed form, we’ll create a rendering of what your mailbox installation will look like and what it will cost. 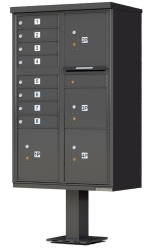 If you need additional help choosing the right mailbox configuration, call us at 800-571-0147. Shop all mailboxes for sale from U.S. Mail Supply.